Over 22 days in September 2010, British arts organization Cape Farewell undertook its ninth art/science expedition to the Arctic. Sailing from Longyearbyen around the north-east coast of Spitsbergen in the Norwegian arctic, a group of fifteen artists and scientists encountered the magnificence of this extreme and threatened environment and engaged with the scientific research being conducted on board. Amongst the crew of marine scientists, writers, musicians, visual artists, directors and architects from around the world was digital artist Matt Clark, Creative Director of United Visual Artists (UVA). 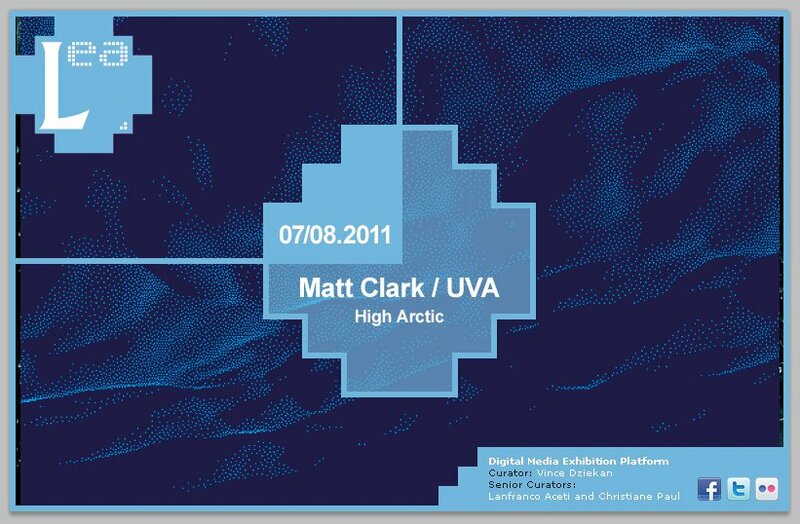 Over the summer, we will be presenting an extended exhibition based on UVA’s large scale commission for the National Maritime Museum (NMM) in London, titled High Arctic. This first part of the exhibition will present Matt Clark’s creative response to his experience of the expedition to the Svalbard archipelago aboard the 100-year-old schooner The Noorderlicht, drawing directly upon his photographs, notations, posts and expedition reports. Developing from these personal insights, the second phase of the exhibition will turn its focus to the translation of these “findings” into UVA’s latest immersive installation, which has been designed as the first temporary show in the National Maritime Museum’s new Sammy Ofer Wing. Set in the possible future of 2100AD, High Arctic conveys the scale, beauty and fragility of our unique Arctic environment. Established in 2003, United Visual Artists are an art and design practice based in London. UVA produce work at the intersection of sculpture, architecture, live performance, moving image and digital installation. Lead by principals Matt Clark, Chris Bird and Ash Nehru, UVA’s team members come from many disciplines including fine art, architecture, communication design, moving image, computer science and engineering. Pushing the boundaries of research, software and engineering with every project, UVA’s work aims above all to be meaningful and engaging.